The Ship Complete Lots feature is designed for lot-numbered items that must be shipped as a whole, complete lot. To use this feature, you’ll need to have purchased the Mobile Picking module for Acctivate. By default, this option is not available in the base Acctivate package. This option will select the entire lot quantity, even if it exceeds the sales order quantity. The sales order quantity will be adjusted to match the total quantity from the selected lot number(s). This option can be toggled for each product. Therefore, some lot-numbered items may sold in quantities less than the entire lot, but others must be sold complete. 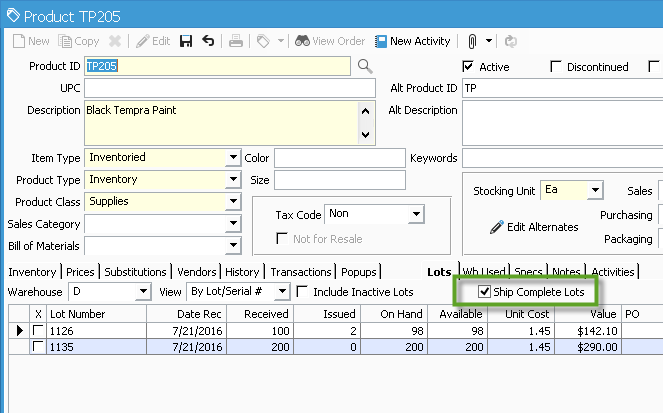 The “Ship Complete Lots” checkbox will appear on the Lot #s tab of the Product Information window when the Control Type is set to Lot-Numbered.